John C. Maxwell is a man after my heart. I’ve loved everything I’ve read by him, but with The 15 Invaluable Laws of Growth, he’s honed in on one of my passions – practical instruction for personal development. In this book, Maxwell is articulating so many ideas that I’ve had a sense of and know to be true while at the same time pushing me further and deeper than I’ve gone before. I have stopped requesting ARCs because I’ve gotten so behind in my reading, but when my friend Sarah showed up at our lunch date yesterday with this one, I gladly accepted it. 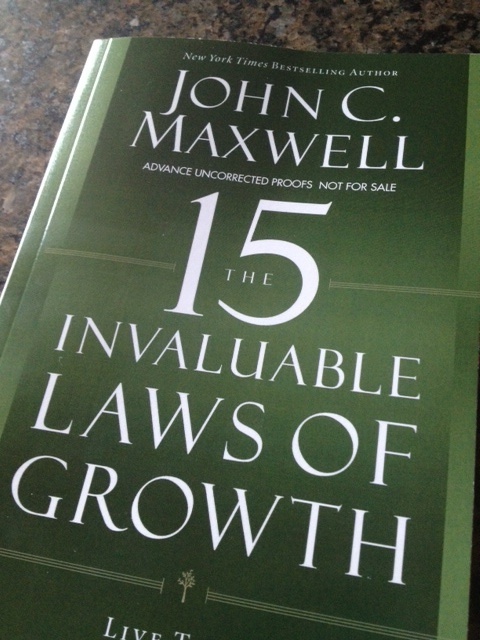 While it is meant to be read slowly – Maxwell suggests a chapter a week in his intro – I couldn’t stop myself, and so I read the first four chapters last night. 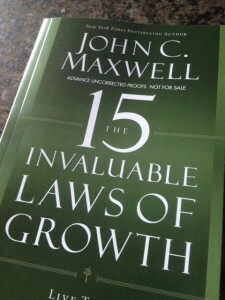 In each chapter of this book Maxwell explores one of his 15 Laws and then gives practical exercises for the reader to complete pertaining to that law. His first chapter is The Law of Intentionality, which is basically the premise of this book on growth – you don’t grow without tackling things with time and effort. Any coach will tell you the way to get stronger, faster, more agile is to practice. You don’t show up on Friday night, Saturday or Sunday afternoon to win a football game without having put in the work ahead of time. This is why my brother’s football team requires summer workouts. Life is very much the same, Maxwell says. In order to reach your full potential, you must be intentional about doing the hard work. These 15 Laws make up the playbook. Because I can already see this post shaping up to be a long one, I’m going to stop here and I’ll pick up very soon with the most valuable insight for me from chapter one; so expect a series of posts on this book. Yes, I think it is that good. And, lest you think me guilty of not following Maxwell’s advice, last night while I was reading (too quickly) through the first part of the book, I did mark the activities from each chapter that I needed to do & started them this morning before I wrote this post. I’ll share more about those later as well.